On this day 100 years ago, Nelson Mandela, the man who ended apartheid in South Africa, was born. Five years after his death the world remembers a man who spent 27 years in prison fighting for what he believed in. Mandela was released from prison on Robben Island in 1990 and became South Africa's first black president four years later after forgiving the apartheid regime that imprisoned him. 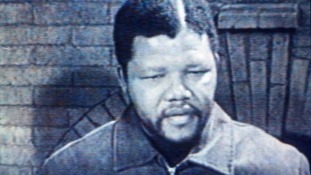 Three days after he walked out of Victor Verster prison and greeted crowds of supporters, former ITV News presenter Sir Trevor McDonald became the first journalist to interview a liberated Mandela. Reacting to Mandela's death in 2013, some 23-years after their historic meeting at Mandela's home in Soweto, South Africa, Sir Trevor looked back at the life of a man who had become a great friend. As the world remembered Mandela on the 100th anniversary of his birth, Barack Obama made his highest-profile speech since leaving office and took the opportunity to thank Mandela for being his inspiration. Obama, who as America's first black president is often compared to Mandela, received a standing ovation from the thousands of South Africans in attendance.